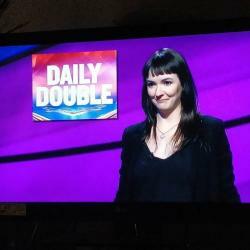 Chelsea Hill, French and International Studies alumna, recently appeared on Jeopardy!, where she placed second. Chelsea sat down with us to talk life after graduation, her time on the show and how her studies came in handy when faced with the Daily Double. After graduating, I've been all over the place: I moved back to my hometown of Cleveland for a summer fellowship with the Cuyahoga County Executive's office before moving to the outskirts of Paris, France to teach English through a program called the Teaching Assistantship Program in France (TAPIF). In July 2016, I moved to Dallas to work in refugee resettlement through the Americorps VISTA program specializing in communications and marketing. After completing my service year, I moved to New York City where I now work for a State Senator's office as an administrative assistant and scheduler. I currently live in Brooklyn with several friends. How did you become a contestant on Jeopardy!? The first step is to take the online test, which is composed of 50 questions covering all different topics. You're never given a score or told how you did, but if you do well enough you might get invited to an in-person audition. I took the online test a couple times in college, and my senior year (on my birthday actually!) I got my first invitation to audition in Detroit, driving up just a couple days after graduating in May 2014. I never got a call back after my first audition, but once I was eligible to try again I took the online test and got another audition, this time going to Minneapolis in May 2017. I got my call to be on the show in October of 2018. Getting on Jeopardy was definitely a lifelong ambition, as I've been a big fan since a young age. Being on the show was fun – obviously a lot of nerves going in, but the producers do a good job of making all the contestants feel comfortable. One of the best parts though was definitely having my brother and friends all the way from Ohio and from L.A. come to the taping. The producers told us to not even look at our guests until our game was over, but I broke that rule many times over. I hadn't seen my Ohio friends or brother in a long time, so just the fact they would fly all the way to the other side of the country and take time off work to be there was really special. How did your education prepare you for the questions? When I hit the Daily Double on the $2000 clue in a category we hadn't started yet, I was definitely a bit scared. I can certainly say my knowledge of French helped! The clue read: "Casanova embodied this 9-letter term whose name comes from the Latin for 'free.’” I'm familiar with the character of Casanova, but what really made the answer come to me was the reference to Latin. French being a Romance language, I instantly thought of French for free which is libre, sparking the connection to Casanova and the word "libertine.” I did not bother to count out the letters.